A sea of red flashes across the ice––Ken Pauly constructively, and quite aggressively, comments on the boys’ play. 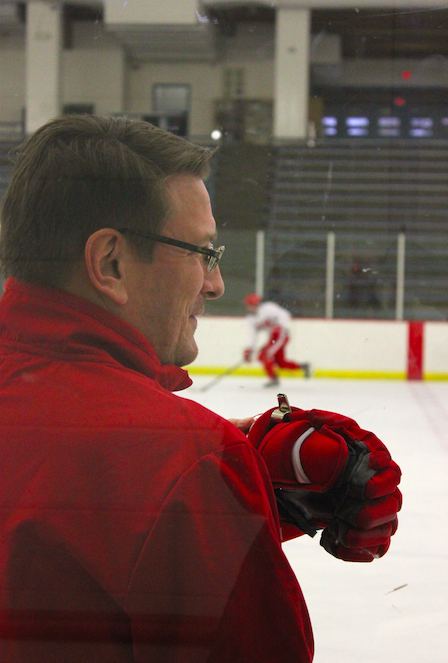 Sitting in on a BSM boys’ hockey practice and watching them play in a game setting, it’s easy to see why head coach Ken Pauly receives so much respect and honor in the greater hockey and BSM communities. Who else would willingly work with a bunch of over-confident hockey guys? But for Pauly, it’s not about the awards or the recognition––it’s about the coaching. Pauly began his coaching career as a mere eighth grader going up against the big, bad ninth grade team in softball. “I put my team together, and I wanted to put together a team that would win. Ultimately, I put the best guys out there, and I put myself on the bench because I thought that they were better than me, and I wanted to win. I’ve always been the one that organized stuff, and I was always the guy on the team that was okay but never great. My contribution was to lead, to organize, and to support,” Pauly said, and to this day it is no different. What he experienced as an eighth grader was not soon forgotten and he began to expand his expertise from softball to youth football and to hockey. Although he coaches two different sports, the idea is the same. “Coaching is coaching, period. You call it coaching, but it’s actually teaching. It’s the same idea,” Pauly said. What sets Pauly apart from other coaches is his dedication to always improving as a coach and as a leader of a team. In order to stay current in any field, the way to achieve that is believed by remaining educated through books, seminars, and other methods. “I’m always reading coaching books. You’re always looking to improve because it’s competitive and you want to do well,” Pauly said. Pauly’s education on coaching doesn’t stop at the tips and strategies found in books––through coaching he has explored psychology and discovered a deep interest within himself and the human brain. By his desire to better understand the players and students he works with, he has shown the utmost commitment to discovering how coaching and the adolescent brain can go hand-in-hand and techniques to garner productive results. “You find in a hurry that it’s not just about hockey––it’s about neuroscience; it’s about relationships, about what kids are going through at this time,” Pauly said. He went on to explain that in order to be a successful coach the drive needs to be there from members of the team. “The great thing about sports and activities is you have a group that largely wants to be there and want to do well at it so you feel an obligation to be the very best you can be and to stay current,” Pauly said. 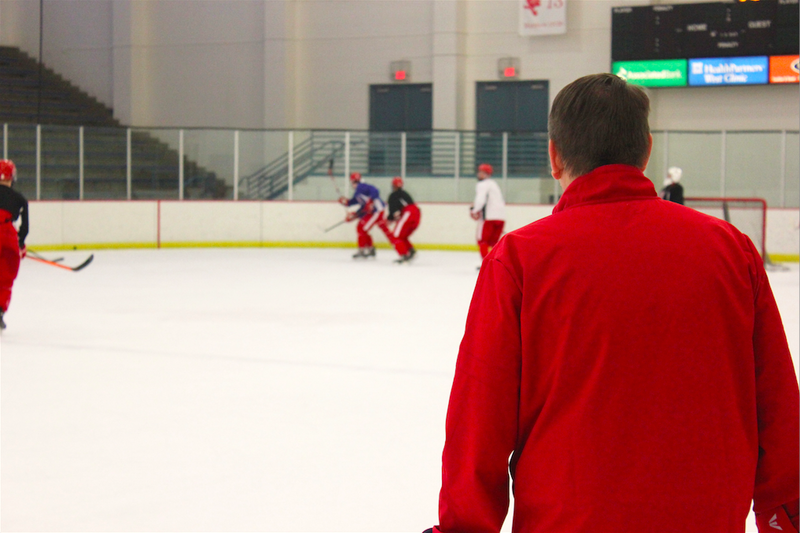 Head boys’ hockey coach of twenty years Ken Pauly presides over practice, aiming to strengthen his team as both players, and people. Being a coach and a part of a program can come with some difficulties when success cannot be met. “We’re all trying to win state titles – that’s a worthy goal but a lousy purpose. And that’s ultimately not our purpose because you’re not always going to win,” Pauly said. In sports there is a preconceived notion that in order to be the best team, it is necessary to win the most games, but Pauly offers a different, realistic approach which sets him apart from other coaches in a way that embodies his character. “The most rewarding thing is when we don’t win, when we don’t achieve our goals and guys still say it was such a rewarding experience and something that they’ll never forget,” Pauly said. During his twenty-plus year tenure at BSM, he has helped catapult the hockey program to one of the top in the state. Though there have been many proud moments, the 2012 state tournament quarterfinal win over Edina was the pinnacle. “It was such an electric game from start to finish. Add in the passion and emotion surrounding Jabby and how our kids and school responded to that––well, it’s pretty tough to top that,” Pauly said. Pauly recognizes that coaching goes beyond the game and cherishes the relationships he has built with the boys and other members of the hockey community. “The deep connection and the really lasting relationships that are forged with the people you work with and the players you work with in terms of your fellow coaches regardless of whether or not your dreams came true [is the most rewarding]. That’s when you realize you’re trying to create something people want to be a part of, something that they’ll remember and something special,” Pauly said. Pauly’s twenty-year career at BSM has provided for great successes and terrible losses. His dedication and enthusiasm for coaching has not diminished and, if possible, grows stronger year after year he spends in the Red Knight community. “I think people are naturally enthusiastic and passionate, you just need to find something, some sort of outlet and for that coaching and hockey happens to be mine. But we all have a pretty small part in a pretty big world and you can always find something,” Pauly said.